A DAY OF MIXED FORTUNES! Right Time showed his toughness by jumping out, sitting outside the leader, kicking clear on straightening and holding off the opposition to the line. It was a good ride by Ryan Hill and even after a delayed start he began well. SUCCESSFUL MORNING AT LARK HILL! DEMOCRATISM EARNS A START IN THE CHAMPION FILLIES! DEMOCRATISM TO CHALLENGE BETTER FILLIES ON SATURDAY! After winning well on Sunday Democratism will be nominated for the Burgess Queen Quality, a listed race for three year old fillies. She's done extremely well and will be really competative if she starts on Saturday. A BIG THANKS TO REVOLITION! LISETTA WINS IN A BREEZE! HARD SPUN LEADING FIRST STALLION!! A SUCCESSFUL DAY AT THE TRIALS! Monday was a very busy day at the trials but successful too. All the horses trialled well. It was pleasing to see unraced gelding Commanding showed great speed, winning the trial easily in the second-fastest trial of the day. WIZAWAY - go the WHIZZ! IT'S BEEN A WEEK OF BRIDESMAIDS! Starting with Flag Officer and Yamumotri running second on Wednesday 20th, Jacobyte running third on Saturday 23rd, Lisetta running second on 27th, and View The Stars and Jacobyte running second and third on Saturday 30th, when will we win one??? Flag Officer continues to improve and was received in the winners circle yesterday by lots of jubilant owners. Craig rode him with confidence, leading and kicking away holding off all opposition comfortably. CRAIG'S EXPRESSION SAYS IT ALL! 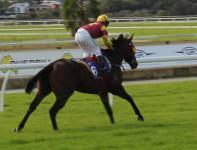 Jacobyte was very professional, he jumped first, made the running and only got caught in the last few strides. He's a game performer and gives himself every chance and tries really hard. I'm sure another win is only just round the corner. A DAY AT THE TRIALS WITH THE TEAM!